Yes, Jacob! I want to get triple-digit richer every 90 days using your time-proven trading system. Please email me your newest trades and sign me up for your 30-day trial. If our new EZ trades don’t deliver the kind of hedge fund-like profits you'd like, you can cancel your yearly membership and get a FULL REFUND during your 30-day trial. If you select monthly billing and decide that it's not for you, just let us know and your subscription will be cancelled before the next monthly charge. and for as Long as You’re a Subscriber TOO! 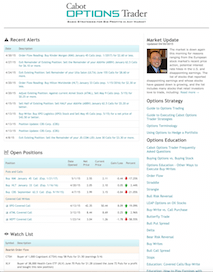 • Weekly Cabot Options Trader trade alerts with 50% to 100% profit potential coming in as little as from 16 to 90 days. • Flash buy and sell alerts via email and text to get you in and out of our trades at the maximum profit point. • 24/7 access to our private Cabot Options Trader Web site, which includes a searchable archive of past issues along with numerous special trading reports designed to make you a better trader and investor. • A continuing education series designed to help you become a more knowledgeable and profitable trader. • FREE lifetime subscription to Cabot Wealth Daily, our email advisory with investing advice from a wide variety of successful investing strategies. • Welcome kit to Cabot Options Trader, consisting of two FREE special reports that show you step-by-step how to get the most out of your FREE trial subscription: Guide to Options Trading and Guide to Executing Options Strategies.